Review by Flavia Malusardi of Shift Exhibition at the Mosaic Rooms, which was part of Shubbak 2017. Shift, part of Shubbak Festival 2017, brought together the work of three young female artists from Saudi Arabia, at their debut in the UK. Showcased at the premises of The Mosaic Rooms, the exhibition was a unique opportunity to grasp the vitality and the engagement of the emerging contemporary art scene in Saudi Arabia. Dana Awartani, I went away and forgot you. A while ago I remembered. I remembered I’d forgotten you. I was dreaming, 2016 (film still). Photograph by Andy Stagg, courtesy of The Mosaic Rooms. In the room of an old, abandoned house, a young, meditative woman calmly sweeps a richly patterned floor in traditional Islamic style. Sweep after sweep, the tiles fade into a pile of dust, revealing a more ordinary tiled floor. I went away and forgot you. A while ago I remembered. I remember I’d forgotten you. I was dreaming is a film by Dana Awartani, which was screened here right beside a breathe-taking intricate installation of the same hand-dyed sand-made floor. Born and raised in Jeddah, Awartani observes the fast urban development of the city, which is Saudi’s largest centre after the capital Ryadh, frantically tending towards a debatable ideal of ‘modernity’. Her work considers the conscious and unconscious process of destruction of the area’s cultural heritage and it generates reflection on issues of preservation for places as well as for people. Zahrah Al Ghamdi, Cell of the Earth, 2017. Photograph by Andy Stagg, courtesy of The Mosaic Rooms. Awartani’s work stood facing a large site-specific installation whose aspect reminded me of the ramparts of an ancient and crumbling city. 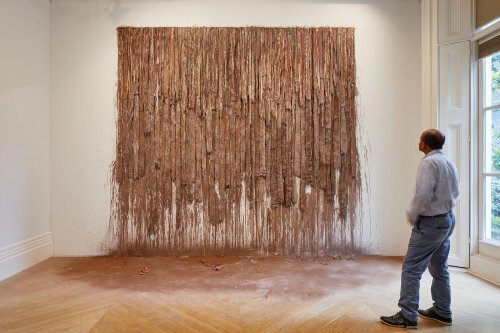 Made of several layers of ropes, fabric, clay, and sand, Zahrah El Ghamdi’s Cell of the City looks like a thick yet transient wall and it is a call to penetrate an imaginary urban fabric. Informed by the artist’s own memory and experience, it was an attempt to address and find an explanation for the loss of the local architecture, where the overwhelming urban growth threatens small towns and villages in the southwest of Saudi Arabia. Cell of the City held multiple meanings. While it was tied to a certain place, it also reflected the artist’s exploration of her own bonds with that space – acting like an architectural diary. The flow of time and memories was well symbolised by the progressive deterioration of the ephemeral artwork during the exhibition. Reem Al-Naser, The Silver Plate, 2017. Photograph by Andy Stagg, courtesy of The Mosaic Rooms. In the lower gallery, two screens faced each other, opposing two different states in conversation. 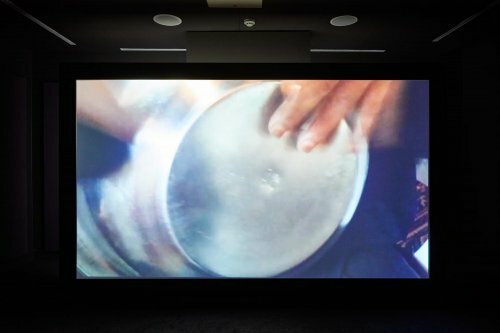 On the one side, a video showed fingers drumming on a plate – a typical gesture during traditional Saudi weddings, while on the other water slowly dripped on the same plate. The videos played on a loop, while the words qareeb (near) and ba’eed (far) whispered in the background, in an increasingly suffocating atmosphere. A booklet with blank pages ‘for your feelings’ complements Reem Al-Nasser’s The Silver Plate. The installation represented one woman’s perception of past, present and future. Stemming from certain behaviours, impressions and symbols the project alludes to the irrevocable negotiation in the constant pull between past and present, tradition and modernity, courage and fear opening up an unexplored gate to the future. As the pamphlet described, ‘The works reflect the artists’ experience of living in their home cities and domestic spaces. They are powerful testimonies by artists caught between a future driven by globalisation and a rapid socio-cultural change, and a past cultural heritage, which is under treat of being erased’. Indeed, the show raised relevant questions around the loss of local culture, and the role of women and especially of women artists in the process of preservation of cultural heritage. In a process of self-discovery, artists embrace their own identity and history and create a space to look at and uncover problematic issues. However, far from being anchored in a sterile nostalgia, they are analysing the shift with a conscious awareness and an eye towards the future.